Product Type: Brodit Active Car Cradle Holder For Fixed Installation. 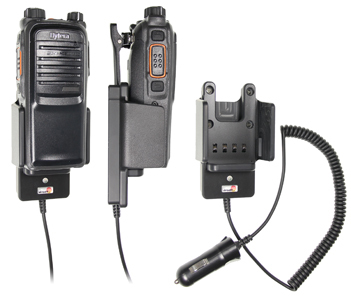 Fitment: Hytera PD785 G For All Countries. The drop-down list below provides a list of other devices which this Active Car Cradle Holder For Fixed Installation also compatible with. That means you can mount the listed devices using this product "as is" without any modifications or additional preparation. Input Transient Protected: Withstands +200V & -600V. A 2,5A fuse is mounted on the incoming supply. Output Short Circuit Protected: The charger will supply a maximum current of 1 A which protects both the charger and the connected equipment. The current limit is set to standards of the producer and shall not be higher.